The best balance bike for a 4 year old will depend on a number of factors, and almost all manufacturers will have balance bikes that are suitable this age group. Children in this age group will be very confident on their feet, although abilities on the bike may vary. Some children may have been practising for 2 years or more on a smaller balance bike and need an upgrade, whereas other children may have preferred scooters or not been introduced to balance bikes before now. Probably the most important factor to consider when looking for the best balance bike for 4 year olds is the size of the bike, and in particular the saddle height. Four and five year old children are much bigger than 2 year olds, so they will need a bigger and heavier bike to support the extra weight. This means that many of the bikes, especially in the higher price bracket, will look and behave more like proper bikes than toys. We would recommend a balance bike with 12 or 14 inch wheels for 4 year olds, as this will provide the basis for the correct size of bike. 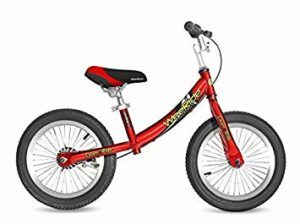 You will also find that balance bikes for this age are generally a bit more expensive than those for smaller children with not as many budget options available. You should always measure the inside leg of your child when you are sizing up the best balance bike to buy. You need to make sure that the lowest setting of the saddle is around 2.5 – 3cm lower than their inside leg, so this means that you will probably find that you will need a saddle height from around 36 - 40cm for a 4 year old. However, children can vary in height at this age so some children will need larger bikes than others. The correct saddle height means that the child will be able to rest their feet flat on the ground easily when sitting on the bike and you can read more on this in our balance bike saddle height guide. Other factors to consider include the style of the bike, the type of frame (it usually comes down to between wooden and metal) and which other features you will like included such as brakes, tyre type and plenty more! 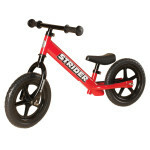 We have highlighted 4 models of balance bike in the table above, and the first of these is the Strider Sport balance bike. Strider balance bikes are sporty and fun to ride, and although the Strider Classic is a fantastic bike we think it is worth an extra £22 for the Strider Sport if you are shopping for a 4 or 5 year old. This is because the Strider Sport is equipped with an extra long seatpost, meaning that you can extend the saddle height to a whopping 48cm. 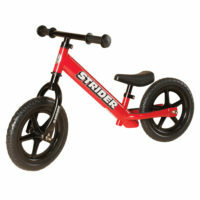 All of the other features of Strider bikes are included, with grippy, off-road tyres and a padded seat for comfort. 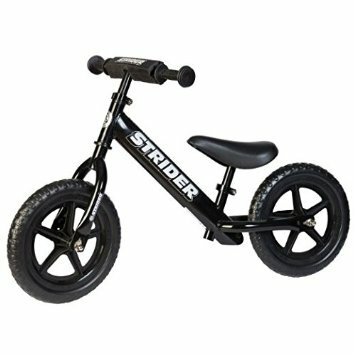 Although the Strider Sport is not a budget option at £88 it is a top quality balance bike and our recommended pick for 4-5 year olds. If you have a bigger budget, then the Strider 12 Pro is also a great option with a lightweight aluminium frame and Ultralight wheels. The Strider 12 Pro is priced at £110. 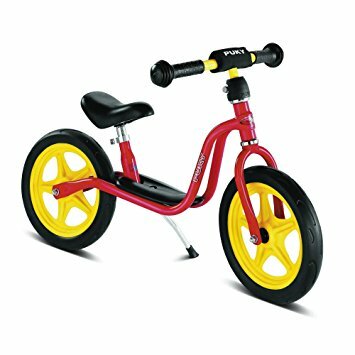 This is another great option for 4 and 5 year olds with a sporty style and 12” wheels. Features include air tyres, alloy wheels, a padded seat and adjustable handlebars. It is available in a number of exciting designs and is priced at around £70. The main difference between this and the Strider Sport is the different tyres. 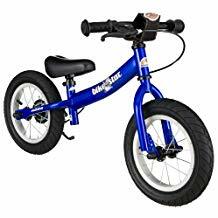 This is a larger balance bike with a 14 inch frame and a higher saddle height so it will be more suitable for bigger 4 year olds or those approaching their fifth birthday. This balance bike really does have the look and feel of a proper bike with a high quality finish to the frame and a range of excellent features including proper air tyres, a rear hand brake and non-slip hand grips. We included the Kiddimoto Kurve in our recommendations for 3 year olds but we are including it here as well as it is such a great bike! 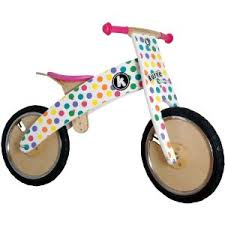 The Kiddimito Kurve is very different from the other balance bikes mentioned here, as it has a wooden frame and is available in a number of different designs including Union Jack and Pastel Dotty. The frame is made from birth plywood and the bike includes 12 inch tyres much like the Strider Sport and Bike Star Sport. The saddle height can be adjusted to 3 different heights between 37cm and 39.5cm, and as this is a limited range it is super important you make sure your child will be the right size for this bike before purchasing. All of these balance bikes would be a great choice for 4 year olds learning to ride, and once they have mastered the concepts of steering and balance they will be more than ready to move on to a pedal bike. Now we are really talking! This is the age when there is nothing to stop children getting on their bikes, learning to ride and really finding their independence! Although some 2 year olds might be reluctant to start using balance bikes, and many 6 year olds will have grown out of balance bikes, most 3 year olds should be raring to go! This means that there is a huge range of models available for children aged around 3, so it would be impossible to fit them all into this review. We have selected our favourite 5 models and listed them in the table below, so you can see the sort of bikes that are available when you are looking for the best balance bike for 3 year olds. By the time your child is approaching their 3rd birthday, they will probably be too big for one of the smaller balance bikes we featured in our reviews for the best balance bikes for 2 year olds. 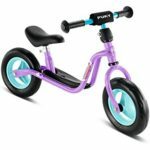 This means they will need a bike with a larger seat height, and this is probably the most important factor to consider when buying a balance bike! You need to make sure that the lowest setting of the saddle is around 2.5 – 3cm lower than the inside leg of the child. The average inside leg measurement for a 3 year old is between 35 – 38cm, so this means that you should be looking for bikes with saddle heights starting from between 32 – 35cm. This means that the child will be able to get on and off the bike comfortably, and as long as the seat is adjustable (which it will be on most models), then a good quality bike bought at this age should see them right through to their first pedal bike. We have more details on seat height in our Balance Bike Seat Height Guide. There are plenty of other things to consider though when choosing a balance bike for a 3 year old, including frame type, style, tyres, brakes and plenty more! We have examined a few of our favourites below. One of our favourite models for 3 years olds is the Chillafish BMXie balance bike which is featured in the table above. 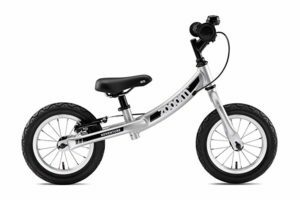 The Chillafish BMXie balance bike has a cool and stylish BMX design, with a frame made from high quality fibre glass material and inflatable tyres for excellent grip. This bike looks and performs like a real BMX! The seat height ranges from 32cm – 39cm so this is perfect for 3 year olds, and the robust design means that this bike should be able to stand the test of whatever most energetic 3 and 4 year olds can throw at it! Another great option is the Puky LR1 Learner bike. Puky provide models for children of all ages, but we find that the Puky LR1 Learner bike is perfect for this age group. The lowest seat height of this bike is 34cm, and it is also different from some other models with the low platform which makes it easier for smaller children to get on and off the bike. This bike was included in our recommended balance bikes for 2 year olds, but we recommend it for 3 year olds as well as it is such a great bike! The saddle height starts at 29cm, but it extends right up to 41cm so it will fit 3 year old riders just as well. The Strider Classic Balance is really lightweight at just 3kg and also includes EVA foam tyres, adjustable handlebars and an integrated footrest to help children do tricks as they get more confident. 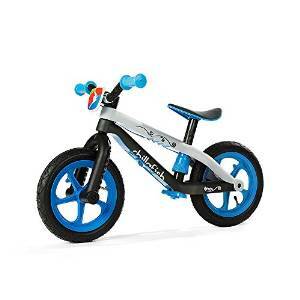 A superb balance bike available for £66. 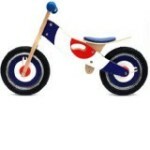 If you would prefer a wooden balance bike for your 3 year old, then there are several options in this category. 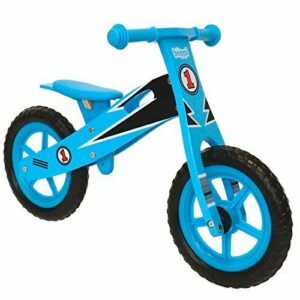 One of the advantages of wooden balance bikes is that they can be painted in all colours so they are available in a lot of fun and exciting designs. Although the saddle does not usually have as many available heights, the range on most bikes should cater for 3 year old needs. The Kiddimoto Kurve series of bikes is perfect for 3 year olds, and you can choose between designs such as Pastel Dotty, Union Jack, Police and Fire among many more. They have a very different look to metal balance bikes – and you may have even seen them on Dragon’s Den! The Kiddimoto Kurve has a higher saddle height that some other balance bikes, with height starting at 37cm and can be adjusted to 39cm. This means it is better for slightly taller children but should be suitable for most 3 year olds. This bike is available from around £45. 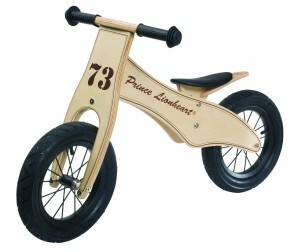 Other excellent wooden balance bikes for 3 year olds are the Prince Lionheart balance bike and the Jiggy Wooden Balance Bike. These bikes are both available for around £50. 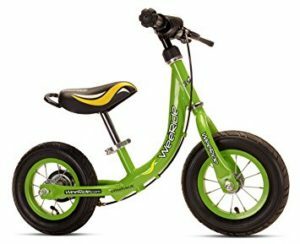 Finally, if you can stretch your budget to close to £100 or more then we would recommend the Adventure Zooom balance bike. This is a stylish and high quality bike that caters perfectly for 3 year olds, and it even comes with 2 different seat posts so you can switch between them as your child grows. Features include a lightweight 6061 aluminium frame, a rear v-brake, quality alloy rims and Kenda tyres, so although it is a top of the range option you really do get what you pay for with this bike. 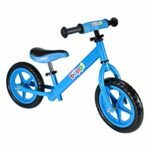 These are just a few of the models available, so there is plenty of choice for the best balance bike for 3 years olds looking to get on their bike and explore the world. We have featured many more on this website, so happy riding! If your child has been using balance bikes since they were 2 or 3, then by the time they approach the age of 6 they should have well and truly mastered the arts of balance and steering and be ready to move on to larger bikes. However, some children do not discover balance bikes or take to cycling until an older age . This could be due to lack of space if you live in a big city, a preference for other activities or that you just don't have enough time to learn to ride with a busy schedule. Other children love balance bikes so much that they want to continue to become expert riders. Balance bikes are much lighter than normal pedal bikes which have a heavy chain and pedals, so they allow children to perform some tricks and stunts that just aren’t possible on normal bikes! 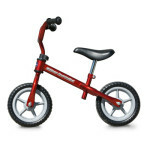 The range of bikes in this category is much smaller than the number of bikes that are available for children aged 18 month – 5 years. But although there is much less choice, there are still some quality options when looking for the best balance bike for 6 year olds, and although older children may not take to riding quite as easily as younger children they still have the choice of several very good models. Wide handlebars for easy control. Strider lead the way in balance bikes for older children, and the Strider Cup is a specialist event for expert balance bike riders where children can show off their tricks and stunts. 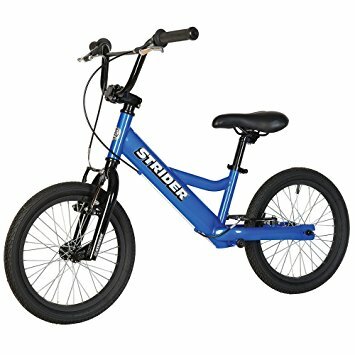 The Strider Youth 16” Sport balance bike is their signature larger model, with a stylish design and a low 3 degree sweep handlebar. This is an important feature as it makes the bike more stable and easier to control. This bike also features a removable launch pad footrest that allows the rider to tuck their feet in as they coast or perform tricks. This is an excellent choice for an older child learning to ride for the first time, or for those dealing with special needs. It is safety tested for riders all the way up to 85kg, and the seat height ranges from 49.5cm through to 64.8cm. This means it is perfect for children in the 6-12 age group for either advanced riding or for those who are not yet ready for a pedal bike for whatever reason. It is available in either blue or red for around £165. Hand brake and kickstand included. 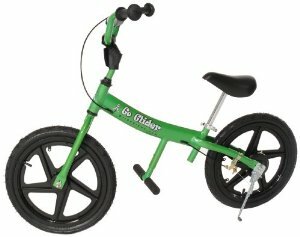 The Go Glider 16" Balance bike is ideal for older children learning to ride, as it has a stylish and sporty design with a metal frame and some excellent features. The bike is equipped with footpegs where children can rest their feet while they are 'gliding', and it also offers a hand brake and a kickstand. The bike has maintenance free EVA tyres, as well as an adjustable saddle. The market for balance bikes for older children is growing, so there are sure to be some more models available for this age group soon. We will keep you updated as soon as they become available!